We are dedicated to providing the best quality driving instruction, training and service to all of our clients regardless of race, religion or gender. 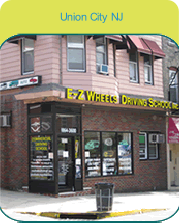 Today, E-Z Wheels Driving School has 7 locations consisting of 5 office locations and 2 additional training facilities. Each office location is equipped with a classroom and space to view instructional videos. Our fleet consists of 7 automobiles, 10 tractor trailers and 4 large buses. All of our vehicles are of industry standard and meet all New Jersey Motor Vehicle Commission (NJMVC) requirements. Our staff consists of 15 members. Our driving instructors are all patient, friendly and highly trained and are certified by NJMVC. All of our staff members are fluent in English and Spanish and two of them are also fluent in Portuguese. We strive to provide our clients with a pleasant family atmosphere. Many of our clients remain in contact with us and visit the school long after they have completed their training.